1. A CHANGE TO ALLOW THE DATA SET READY (MODEM) TO GO ACTIVE WITHOUT HAVING TO ANSWER A PHONE CALL. 2. A CHANGE TO SEPARATE OF THE TRANSMITTER AND RECEIVER LEADS. 3. A WAY TO ALTER THE TIME DELAY BETWEEN REQUEST TO SEND (RTS) INITIATION AND RECEIPT OF THE CLEAR TO SEND (CTS) SIGNALS. A. VIEWING BOARD WITH PC CHASSIS CONNECTOR TO LEFT (WHITE BOXES TO LEFT ALSO). B. LOCATE M16 ETCHED ON BOARD (MIDDLE9 BOTTOM). C.	FIND 62K RESISTOR TO LEFT OF M16 ETCH. D.	UNSOLDER LOWER END OF 62K RESISTOR FROM BOARD. E. LAY LOWER END OF RESISTOR ON FAT TRACE THAT WENT UNDER THE RESISTOR IN IT'S ORIGINAL LOCATION. F. SOLDER THE LOWER END OF THE 62K RESISTOR TO THE FAT TRACE. THIS WILL SUPPLY A NEGATIVE (TRUE) SIGNAL TO THE CCT ENABLING THE MODEM'S DATA SET READY (DSR) SIGNAL. A. REMOVE STRAP "A", IT LOCATED AT THE TOP LEFT END OF THE SMALL WHITE BOX. THIS WILL SEPARATE THE TRANSMITTER AND THE RECEIVER. 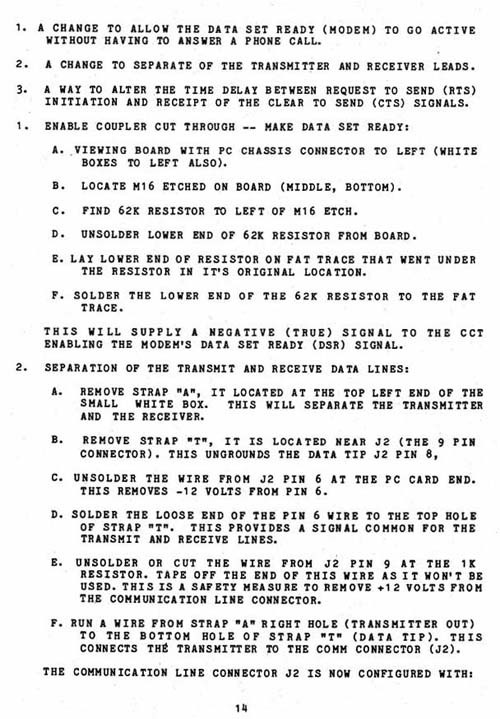 C. UNSOLDER THE WIRE FROM J2 PIN 6 AT THE PC CARD END. THIS REMOVES -12 VOLTS FROM PIN 6. D. SOLDER THE LOOSE END OF THE PIN 6 WIRE TO THE TOP HOLE OF STRAP 'IT". THIS PROVIDES A SIGNAL COMMON FOR THE TRANSMIT AND RECEIVE LINES. E. UNSOLDER OR CUT THE WIRE FROM J2 PIN 9 AT THE 1K RESISTOR. TAPE OFF THE END OF THIS WIRE AS IT WON' T BE USED. THI S IS A SAF ETY MEA SU RE TO REM OVE +1 2 VOLT S FRO M THE COMMUNICATION LINE CONNECTOR. F. RUN A WIRE FROM STRAP "All RIGHT HOLE (TRANSMITTER OUT) TO THE BOTTOM HOLE OF STRAP 'IT" (DATA TIP). THIS CONNECTS THE TRANSMITTER TO THE COMM CONNECTOR (J2).